"Fajitas are easily my family's favorite! 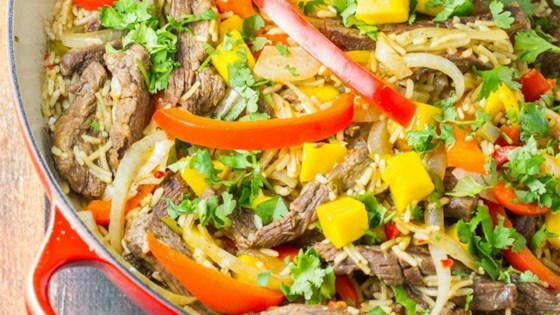 The Knorr® Mango Fajita Skillet takes it up a few notches with the surprise burst of sweet mango and the amazing flavors of Knorr® Mexican Rice. Your family will love this on its own, or served on flour tortillas with a dollop of sour cream!" Place lime juice, 1 tablespoon extra-virgin olive oil and 1 clove minced garlic into a resealable 1-gallon plastic bag. Pound steak to 1/4 inch thickness; slice into 1/2-inch strips. Place in bag with marinade; seal shut. Turn bag over to distribute marinade. Refrigerate and let marinate for at least 30 minutes. Remove meat from plastic bag; discard marinade. Heat 2 tablespoons olive oil in a large skillet. Add meat; cook and stir until well-browned, about 5 minutes. Add onions, peppers, 1 clove minced garlic, jalapeno, water, 1/4 lime juice and salt and pepper to taste, bring to a simmer. Add Knorr(R) Rice SidesTM - Mexican flavored rice, stir, cover and cook until most the water is absorbed and rice is cooked through, stirring occasionally, 7 to 10 minutes. Toss in mango and cilantro to warm. Serve immediately as a skillet meal, or serve in flour tortillas with sour cream! I doubled the recipe because of our large family. Everyone loved it and we had leftovers to take for lunch the next day. It's a very good dish. Don't go too crazy with the mango or it's overwhelming. I used half of one and it was great!